Alcoholism is technically an illness of the brain but recognising the symptoms in oneself can be difficult. The way in which alcohol affects the brain can make it hard to tell when alcohol use has become a problem. However, because of the serious nature of this illness, it is important to learn what the signs are and when to take action. Alcohol addiction is an illness of the brain, and although it cannot be diagnosed with a physical examination or a blood test, there are certain signs and symptoms that indicate a problem exists. These signs may include behavioural changes as well as physical symptoms. What you should know though is that many people with alcohol abuse or addiction problems find it difficult to spot the signs in themselves. It is often a family member or friend who may first realise that something is not right. If your loved ones have suggested that you may be drinking too much, it is a good idea to consider the common signs and symptoms to determine if they could be right. You might feel that you may have an easier life if you hide your alcohol use from those you love, especially if they have been on at you to cut down on your consumption. If you have an alcohol addiction and a physical dependency, cutting down may not be so easy, so in your eyes, the answer is to hide the evidence. This can leave you becoming increasingly isolated from those around you as you attempt to keep your drinking habits a secret. If you are doing this and yet insist you do not have an alcohol problem, then you are not only lying to your loved ones, but you are also lying to yourself as well. When you first started drinking alcohol, you had control over how much you drank and when you stopped drinking. But as your drinking increased, you likely built up a tolerance to the effects and may have become caught in a cycle where the more alcohol you consumed, the less you felt the effects, so the more you subsequently consumed. Prolonged regular abuse of alcohol can have a profound effect on the body. As you continue to abuse alcohol, your body may get used to it and you may crave it when the effects wear off. This can have an impact on the amount of control you have over your alcohol use. As you become physically and psychologically dependent on alcohol, you may drink out of necessity and not out of want. This usually means that you may be unable to resist the urge to drink and, once you do start, you may be unable to stop. Blackouts are quite common among those with alcoholism and there is a very good reason this happens. Alcohol is a depressant drug that has a negative impact on the central nervous system. It works by slowing down various body functions and can impair the way in which the brain functions. When a large quantity of alcohol is consumed, it can cause the brain to stop recording memories. 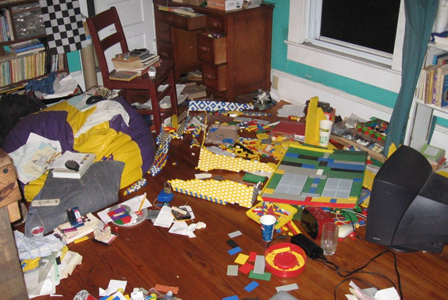 This results in you waking up after a particularly heavy drinking session with no memory of what happened the night before. Blackouts are also classed as alcohol-induced short-term memory loss. You should know that chronic alcohol abuse can have an impact on long-term memory, where you might struggle to remember things even on days where you have not been drinking. When alcohol use becomes an addiction, it can take over your life. It may crowd out everything else. Even family members and activities that were once important to you, may all take a backseat to your need for alcohol. In your mind, nothing may matter except the next drink and how you are going to get it. When your whole world revolves around alcohol and drinking, you are likely to neglect your responsibilities at home and at work. If all you can think about is alcohol, and if it has become more important than your family, job, and interests, you are likely to have little time for anything else. You may put alcohol above all else and everyone else may be forced to pick up the pieces. When you have little time for anything but drinking alcohol, the people in your life are bound to become upset and frustrated. They may not understand why you continually put alcohol above them and they may find it hard to understand why you continue to drink alcohol when it is having such a negative impact on your and their lives. As you might imagine, alcoholism can place a massive strain on relationships. Even once healthy relationships may be affected and pushed to breaking point. Those who have never experienced addiction first-hand may struggle to understand the grip it can have over a person. When you develop a physical dependence on alcohol, your body may crave it when the effects wear off. As mentioned above, alcohol is a central nervous system depressant and causes the body to slow down certain functions when consumed. When you first started drinking alcohol, your body would have tried to resist the changes brought on by the chemicals by speeding up the affected bodily processes. When the effects of alcohol wore off, your body would have adjusted again in an effort to return to normal. Over time though, your body may have become used to the presence of alcohol to the extent that whenever the effects wore off, it would react by racing in response to the withdrawal of the chemical it has learned to rely on. This can cause you to experience a rapid heartbeat, loss of appetite, tremors, and sweating; you might also experience headaches and mood swings. You may have noticed, though, that a sip or two of alcohol can help to ease these symptoms. This is a serious deviation to the withdrawal process and can cause an early relapse. This is why it is vital that, if a withdrawal seems too hard to manage on your own, you call your GP or a detoxification specialist to get supervision. 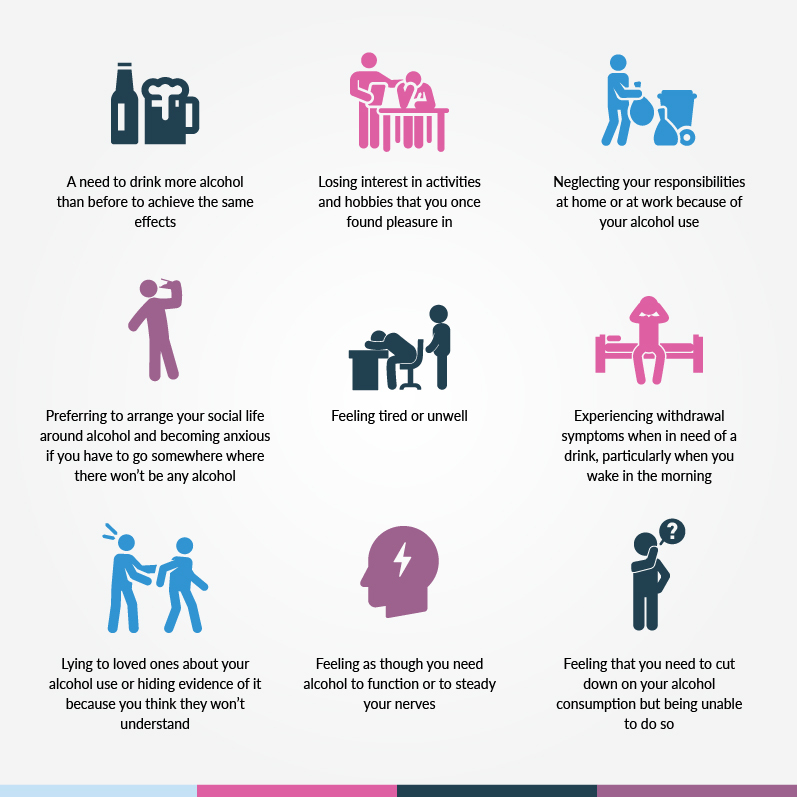 What Are the Emotional Symptoms of Alcohol Addiction? Alcohol addiction can have a profound impact on mental health and emotions. Mood is affected by an imbalance of chemicals in the brain and so because alcohol is a depressant, it can affect this balance and cause a multitude of problems. Although many people drink alcohol to relieve symptoms of mood disorders such as depression and anxiety, there is evidence to suggest that alcohol can actually make anxiety worse. Moderate alcohol use can affect the part of the brain that is responsible for inhibition, which can help to make you feel less anxious. However, the more alcohol you drink, the more parts of the brain are affected and the more chance there is that it may negatively affect your emotions. This can lead you to depression, anxiety, anger, and aggressiveness. 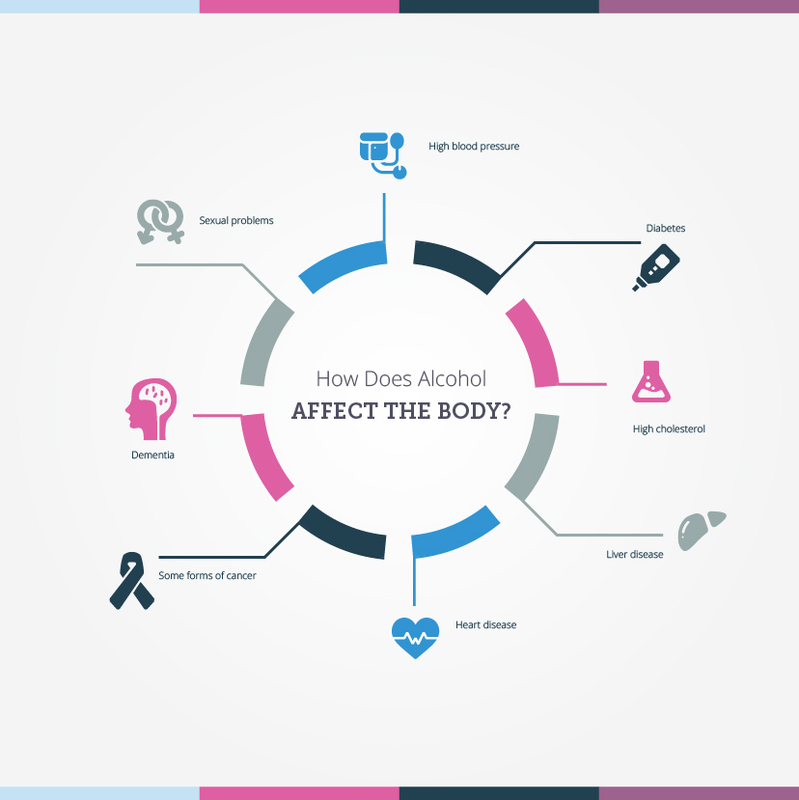 Alcohol abuse can have both short- and long-term effects on various parts of the body. In the short-term, it can affect coordination and judgement, which could increase the risk of, for example, accidental injury. Another example: because you are more likely to take risks due to decreased inhibition and impaired co-ordination due to the amount of alcohol you have consumed, you risk a head injury through a fall or becoming the victim of sexual abuse. Moderate alcohol use can cause you to become more talkative due to the effects it is having on the central nervous system. It increases heart rate and causes blood vessels to expand, making you feel warm and relaxed. With higher amounts of alcohol though, your liver may be affected as it may be working overtime to process all the alcohol. As it can only process around one unit of alcohol per hour, drinking large amounts can mean that alcohol stays in your system longer. This causes problems such as slurred speech, a loss of focus, and slower reaction times. You might feel drowsy and as your body tries to get rid of the alcohol in your system, and you may need to urinate more often as alcohol is a diuretic, which can leave you dehydrated and suffering from a headache. Alcohol abuse and dependence can seriously impair mental health and can affect mood, emotions, and thinking. 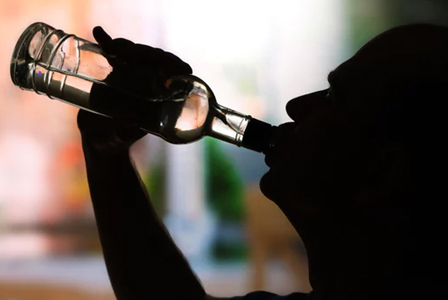 But while some individuals drink alcohol to relieve the symptoms of a mental health disorder, drinking too much alcohol can also be the cause of mental health problems. Since alcohol can provide temporary relief from symptoms of anxiety and depression, there is a temptation to drink in order to change your mood. Nonetheless, when the effects of the alcohol wear off, these problems remain; in fact, they may be worse. Chronic alcohol use, or alcoholism, can lead to many serious mental and physical health problems, some of which can end up being life-threatening. Long-term use of alcohol can have serious implications for your liver. Conditions such as fatty liver, alcoholic hepatitis, cirrhosis, and viral hepatitis can all be caused by alcohol abuse, and while fatty liver may be reversible, the other conditions can result in significant issues. One thing you might not be aware of is the fact that alcohol abuse can also increase the risk of developing certain forms of cancer. Scientists have found a strong link between some cancers and people suffering from alcoholism. They have also discovered that those who do not have an alcohol addiction but who drink more than the recommended weekly allowance of fourteen units have a higher risk for developing these cancers than those who drink less than the recommended allowance. It is also important to remember that alcohol abuse can lead to damage to the brain. In fact, consuming more than the recommended guideline amount increases the risk of conditions such as vascular dementia and Alzheimer’s disease. Alcohol addiction has many negative consequences, not least of which is the impact that it has on mental and physical health. But it can also severely hamper your quality of life. When alcohol becomes more important than anything else in your life, relationships may suffer, and you may become isolated. If you are spending every penny on your addiction, your financial situation may deteriorate, leaving you and your family in trouble. This can have an even more detrimental impact on your relationships, some of which may even break down completely. If you find yourself in a situation where you are in danger of losing your family, friends, job, and home, you may get to a point where you feel you have no choice but to take certain desperate measures – alcohol often plays a significant role in suicides, unfortunately. You should know that alcohol is also linked to poor health, unemployment, poverty, relationship troubles, crime, homelessness, imprisonment, and premature death. To wrap this article up, let’s summarise. An alcoholic is a term that is used to describe someone suffering from the illness ‘alcoholism’. Alcoholism is an illness of the brain that causes a compulsion to drink through intense cravings for alcohol. An alcohol addiction is made up of two elements: a physical addiction and a psychological addiction. If you are affected by alcoholism, you could have no control over your alcohol use. You may feel compelled to drink even when you know that doing so can cause negative consequences for you and the people you love.